I recently decided to limit my intake of sugar, after having a huge sweet tooth for most of my life (if I seemed a bit aloof last time you were in the store, this may have been why, ha!). My goal is to first conquer this myself, and then slowly try to bring my family on board with me (they are not super excited about change so I must tread gently). One of the things I have learned is that the easiest and best way to cut down on added sugar in our lives is to make more foods ourselves, rather than relying on already made varieties. Of course that can be hard to accomplish with our busy schedules (if you're feeling run down, check out our blog on taking some me-time for yourself) so I'm always on the hunt for quick and easy ways to add real food nutrition. This is one such snack! As I'm sure you know by now I have a very picky son who is not too keen on odd textures or flavours. Take chickpeas (or Garbanzo beans) for instance. This little bean is full of fiber and protein, and are also high in manganese and iron. But it's texture has never passed my son's tastebud test. But introduce a little trick like roasting - and all of a sudden the mushy pea is turned into a crispy, tasty treat! And the flavour combinations are endless! By the way, if you have any questions about my sugar-free experience, feel free to email! I can also recommend watching That Sugar Film which is a great resource of the effects of added sugar in "healthy" foods we eat every day. These are so easy to make and your little ones can help. Give your chickpeas a good rinse in a strainer. Dry on paper towels. The dryer they are, the crispier the result. I like to place them on a paper towel and take another paper towel and rub them. This will also pop the little skin off, but leaving them on is fine too. When they are completely dry, toss with 1-2 teaspoons of olive oil and season with salt. Spread the chickpeas out in an even layer on a baking sheet. Roast in the middle of your oven for 20-30 minutes, shaking the pan every 10 minutes or so. 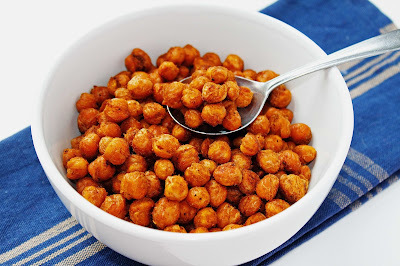 Chickpeas are done when they are nice and golden brown and crispy. They are very tasty with just salt, but if you want to make it interesting you can season them with any number of combinations once they are done roasting. For a spicy snack, use chili powder or curry powder or garlic or paprika. You can also use herbs like thyme or rosemary, or for a sweeter treat, a mix of cinnamon and sugar. The important thing to remember is that these seasonings are best added after the chickpeas have finished roasting, as they might burn and taste bitter otherwise. Eat them while they are warm for the crispiest result. They are delicious cold as well, just store in an airtight container, but will soften and turn more chewy as they cool off. Eat as is for a snack, or add them to a salad or instead of croutons in a soup.